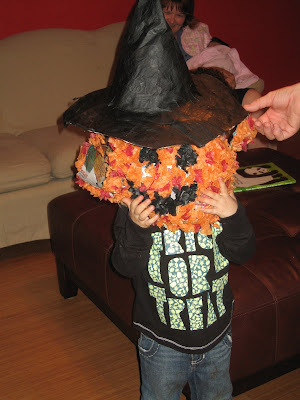 This is one of the Halloween posts I warned you about. It’s actually About Baby Girl’s birthday party, but she had a Halloween party so, yeah. I didn’t realize October had slipped by so fast so, on the Sunday before her birthday when they called her to the front of the room and sang to her during primary I had a mini panic attack. In my head I had at least another week. I asked her that night at bed time what she wanted her party to be like. 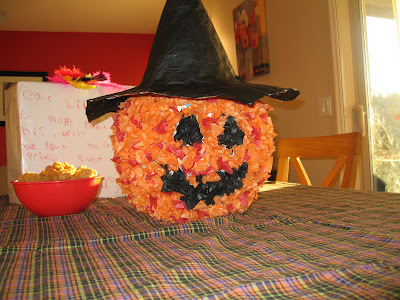 She said she wanted a Halloween party with a pumpkin in a witch hat pinata, pin the tail on the black cat and a witch cake. That was good news for me, nothing too involved. Even better news was her guest list, the only people she mentioned inviting were her cousins and Bestest. We went ahead and invited Bestest’s whole family, just because. The menu she requested was spaghetti, chicken nuggets, (this was a surprise, she hasn’t historically been a fan of nuggets) carrots and apples. 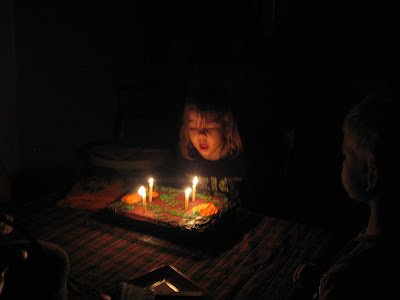 In short, my child requested the simplest birthday party ever. I set out to throw the pinata together the day before the party. I figured it would take maybe two hours, I could easily knock it out during nap time. The thing is, I decided it would look soooo much better if I made it with little tufts instead of flat paper (note to self, tell the story about kindergarten and the tissue paper tufts later in the month) This was probably the worst decision a time crunched, crafted-out mother could make. By the time I finished it I wished I could chop off my fingers. I like the way it turned out though. Another problem with the tuft method? It doesn’t lend extra strength to the pinata like flat tissue would have done. I wired the thing up and decided it would not be strong enough to support it’s candy load. The wire would have ripped through the minute I lifted it. Solution? We went wireless and had the kids stand in a circle and toss it back and forth until it yielded it’s booty. I thought that was actually a better method for little kids like mine who haven’t yet mastered the art of wielding a stick. The coolest thing about the pinata was how it had an after life as a mask. All the kids had a turn, so I have multitudes of photos of pumpkinheaded children but I like Baby Girls outfit the best so here she is. There was chocolate, play dough, pez refills and popcorn balls inside. 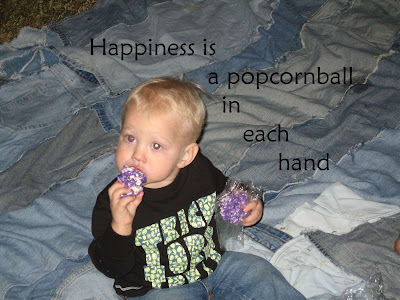 The Popcorn balls weren’t much of a hit with anyone other than Tiny. He liked them though. Baby Girl continued to revise her cake ideas up to the last minute. It went from a witch cake to a pumpkin cake to a cake with pumpkins on it. My favorite part about her changing her mind repeatedly was how the cake got easier with every change. 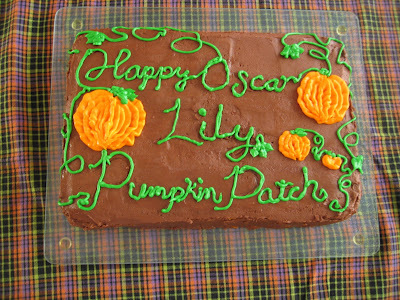 In the end she settled on a fudgy pumpkin patch with the words “Happy Oscar Lily Pumpkin patch.” Man that cake was good. Great party post. I really like your pinata and the tossing idea. You are so CLEVER!